Part One - What your suspension does, how and why. These days, just about every bike that comes out of the showroom has a bewildering array of suspension adjustments available, meaning that you, the owner, are fully at liberty to completely muck up the handling and ride of your previously finely balanced machine. Alternatively, of course, you could make some subtle adjustments which result in a noticeable improvement in the way your machine feels. This short series of articles is intended to help you avoid the former and achieve the latter. But before you read on, please understand that this is a magazine article and by its very nature it must be generic. It is not fine tuned for you or your bike, and any changes you make to your bike setup are your responsibility alone. There are some good ground rules you should bear in mind. Take a note of the settings before you start. Ideally you should be starting from the factory default, but whatever you do make sure you note where you start from and what you do. Ideally you should also note the effect the changes have. Only change one thing at a time where possible – the only exception being when you start off if you decide to set everything to standard. It is essential that your tyres are the correct size and profile and at the right pressure as without this basic check none of your results will be reliable or predictable. Plus your bike will probably feel horrible, regardless. Right. So what does your suspension actually do? And more importantly, what is its job? 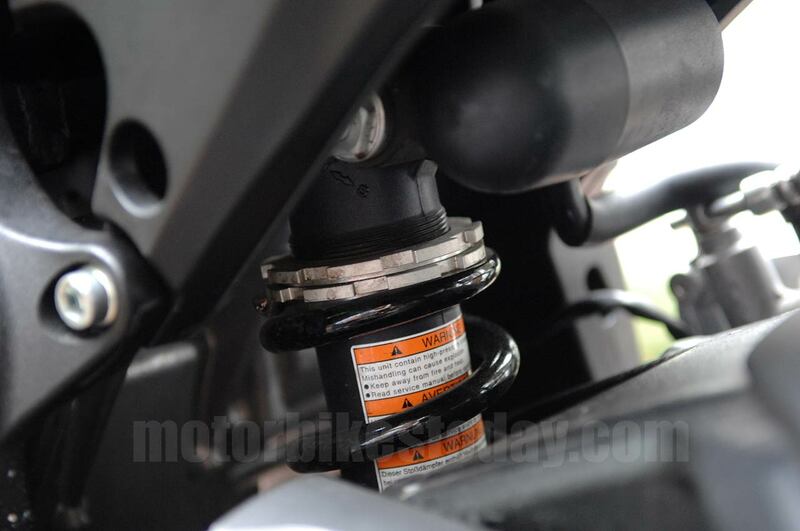 Your suspension acts as a cushion, a shock absorber, between irregularities of the road surface and your bike. It therefore resists compression – when you hit a bump – and encourages rebound (after you hit that bump it pushes the wheel back into the road). Suspension basically consists of two elements – pneumatic tyres and spring/damper assemblies in the form of front forks and rear shock. For the purposes of this exercise, I’m afraid we’re going to ignore oddities like BMW Telelever forks or Bimota Tesi hub-centre steering. Sorry. We’re also going to take tyres as a constant, and assume that they are at the correct pressures and so play no major part in the adjustments we’re making. You may be surprised, even a little disappointed, to learn that making your ride more comfortable is very much a secondary function. Your suspension’s job is to keep the tyres in contact with the ground as much of the time as possible. 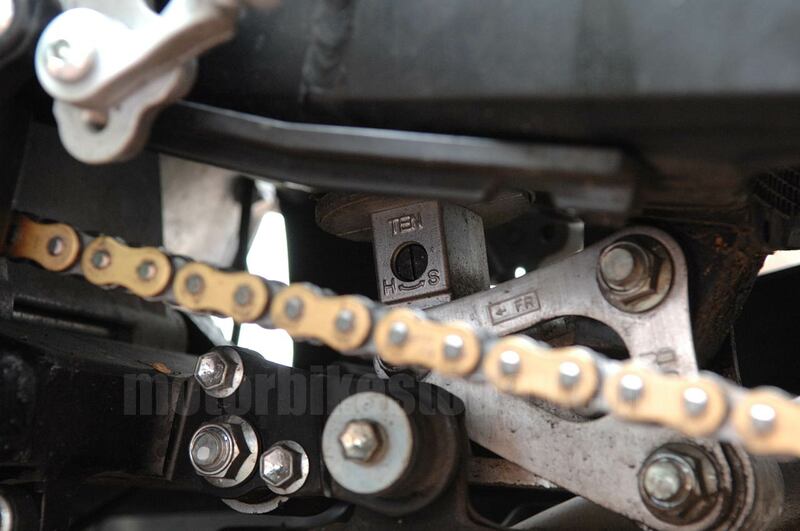 You should note, though, that you can have an enormous effect on the way your suspension works, primarily by being too stiff when you ride – if your arms are locked, for example, then the forks have to deal directly with all your upper body weight rather than that being damped out by your elbows. We’ll cover that in more detail later, anyway. So I mentioned a spring/damper assembly, forks and rear shock. Fundamentally these are one and the same thing. 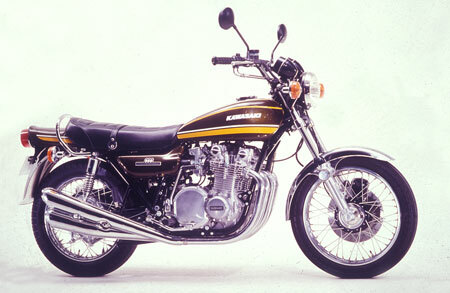 years ago, bikes had twin rear shocks and then the similarity with forks was easier to see. But basically a fork is a pair of long thin shock absorbers, just like you have on the back. And a shock absorber is a combined spring and damper. The spring’s job is to provide the basic force which resists suspension compression and assists rebound. I’m not going to insult your intelligence by telling you what a spring is. What we need to understand right now is that a spring has two variables, preload and spring rate. Spring rate is a constant in that it can only be changed by changing the spring, but it determines the amount of force needed to compress the spring a given amount, and it is a function of the number or spring coils and the thickness of material used to make the spring. Preload, on the other hand, is easily adjustable by changing the length of the spring as fitted. That is done by screwing in an adjuster cap on a forkleg or by adjusting the spring collar on a rear shock. This adjustment changes the amount of force needed to start the spring moving in the first place but (and this is important) doesn’t change the rate it moves afterward. That’s fixed. Changing spring preload also affects one of the basic setup components, static sag, which we’ll talk about later. As I hinted before, the damper’s job is to control the rate at which the spring moves. It also acts to reduce bounce. Imagine you just had a spring and no damping. Like, say, a pogo stick. One bounce will keep going until gradually it runs out of energy. If it’s easier then think of dropping a tennis ball, which is a completely undamped spring. It bounces and keeps going until it runs out of energy after half a dozen cycles. Now imagine what that would feel like if it was the way your bike suspension worked and you went over a speed bump. Or even a catseye at higher speeds. You’d bounce all over the road and it would not be fun at all. There are two areas of damping; compression and rebound. The first controls the rate the spring can move when it’s being compressed (you hit a bump) and the second when it’s extending. I know, it’s obvious. 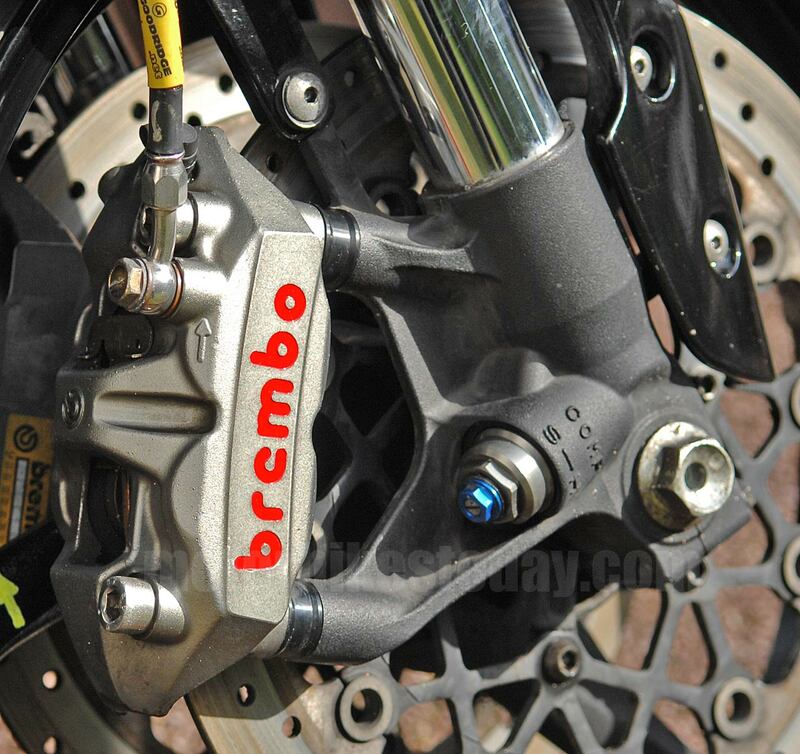 A damper is a device which slows movement down, and on almost all motorbikes since the 1960s this has been achieved through hydraulics. A tube is filled with oil and a piston on a rod is placed in it. There are holes in the piston which allow the oil to pass through, though there will always be some restriction. The bigger the holes, the less restriction. Attach the tube to one part of the thing you want to slow down, and attach the rod to the other part. You now have a damper. A system of valves means that you can make the damper work at a different rate in each direction, should you so wish. Some sort of peculiar magic means that on modern suspension the holes can be adjusted without the use of a drill and several hours taking things apart. In essence, an adjustable needle valve acts on the hole(s) through which the oil passes, allowing the flow to be increased or decreased as required. Taking all this together, you have at least six things to adjust on your suspension – front and rear preload, compression and rebound damping – so the potential to get it catastrophically wrong is very high indeed. The next instalments will try to help with all that. It’s probably a good idea to discuss how you adjust your suspension here as well. Ideally you’ll have read your owner’s manual and will be fully au fait with the correct way to do this. But in case you haven’t got it, here’s a simple guide. First of all, turning a screw or nut clockwise, inwards or downwards will generally increase whatever it is you’re adjusting. Second, if there are two adjusters doing the same thing on opposite sides (on fork legs or twin rear shocks, for example) then you MUST make sure they both have the same settings. Third, damping adjustments are always stated as clicks (or turns) out from maximum. Preload adjustments are usually given from minimum, but not always. Suspension will always have preload adjustment on the back, and usually on the front. Most bikes have rebound damping adjustment as well. Some also have compression damping adjustment, while a few have high speed and low speed compression damping adjustment. Just to confuse things. On conventional forks, spring preload is adjusted using a nut on top of the fork leg. You’ll need two spanners, one to turn the adjustment cap and the other to make sure the fork top doesn’t unscrew. That would be messy and potentially dangerous as the spring is under load and would come out quite enthusiastically. The adjuster has lines engraved around it that you can use to measure where it currently is. The manual should say, for instance. “4 lines showing” in which case you would adjust it so that the bottom of those four lines was level with the fork top and therefore just visible. Screwing these caps down so that fewer lines show will increase preload. Check that both sides are set the same and make a note of the settings. The small screw in the middle of the adjuster cap is for rebound damping. As you turn it with a screwdriver you will feel a distinct click. Screw one all the way in until it won’t turn any more and count the clicks. Don’t force it. Wind it back out the same distance and do the same with the other side. Hopefully the clicks are the same on each side already. Screwing them in will increase rebound damping, out will reduce it. Make a note of the setting. At the bottom of each fork leg you may find another screw adjuster. 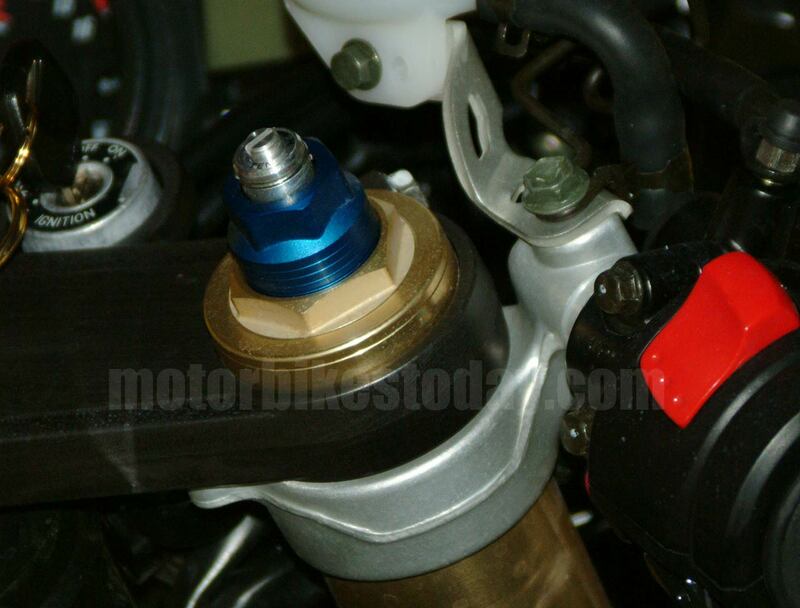 This handles compression damping, and works in the same way as the rebound adjuster. Go through the same routine – screw it all the way in, counting the clicks, and then back out the same amount, comparing both sides. Make a note of the setting. Big Piston Forks are a relatively new innovation on road bikes. They seem to work better than conventional forks, but if they’re not adjusted properly then they’ll still be rubbish. To confuse things, spring preload is set at the bottom of the forkleg, using an allen key. Count the number of turns it takes screwing the adjuster in until it stops, then come back the same amount to return to where you were. Compression and rebound damping are both adjusted using screws on top of the fork caps. The adjustment mechanism remains the same as before. The rear shock preload is usually adjusted using a c-spanner, bad language and several inches of removed knuckle skin. The top of the shock is threaded and there are two rings which can be screwed down onto the spring to increase preload or backed off to reduce it. The inner ring bears on the spring, the outer acts as a locknut. Very upmarket rear shocks have a remote adjuster, which is nice. Twin shocks usually have a single stepped ring, again adjusted with a c-spanner but much easier to reach. There will be three to six preset positions on it, and probably no other adjustment will be available. 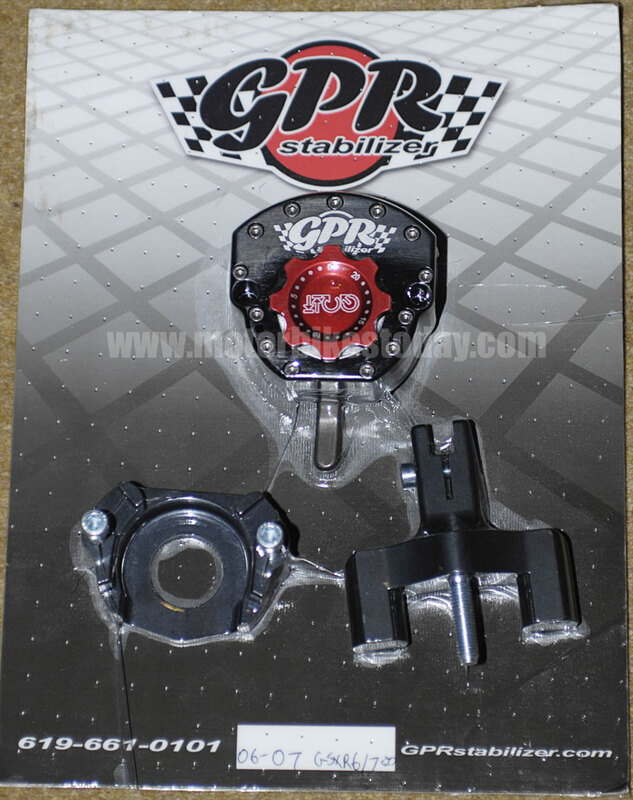 Rebound damping on the rear shock is usually adjusted with a screw at the bottom of the shock body, just above the suspension linkages, while compression damping is adjusted through a specially cast hole in the frame, reaching a screw adjuster on the top of the shock. I would seriously recommend setting everything to the manufacturer’s standard settings before you start adjusting anything unless you have a strong reason not to. Either way, though, make a note of the setting of everything before you go any further. There’s a handy chart which should be about the right size to fit in you manual that you can download here and print.